For the first time since I took up knitting again in February I've been in a rut. I just didn't feel like doing anything, I guess I am a typical case of empty batteries. I'm still knitting a scarf that has been on the needle for more than a month, but I could only manage a few lines each day. Then on the 20th we celebrated an early christmas with my cousins and all my uncles and one aunt (she was the only girl to six boys). 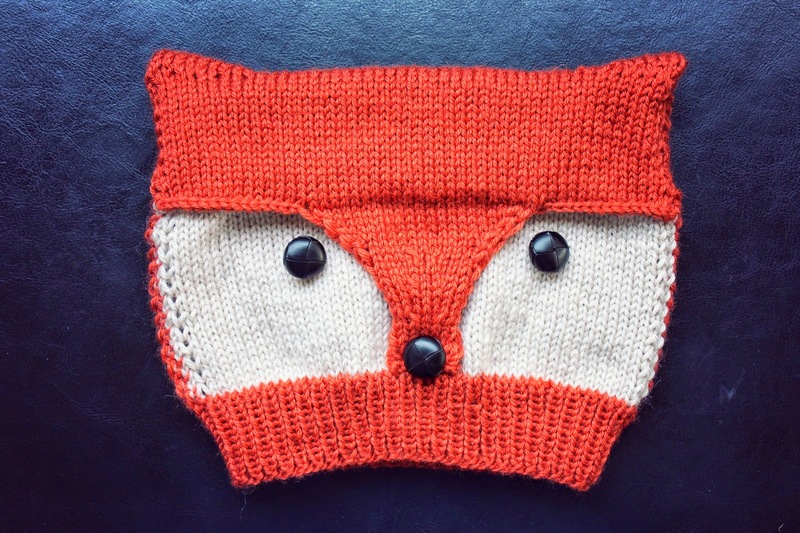 When I saw my little nephew and his fox trousers I knew he had to have a Foxy Hat. I'd seen it a couple of times in different blogs, most recently on ela-strickt. I thought it was very cute, but my kids are too grown up for an animal hat, so I forgot about it again - until I saw Andrin. I really enjoyed knitting this hat. It was challenging enough because there were four new techniques I had to learn - the twisted German cast on, knitting intarsia, short row shadow wraps and the three needle bind off. They were all very well explained and I managed fine. I am very happy with how it turned out! so cute and adorable :) Love the fox! !